By William R. McKay, et al. 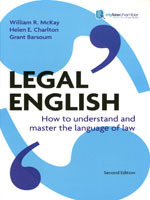 Legal English: How to Understand and Master the Language of Law offers a contemporary guide for students and practitioners alike who want to improve their language skills and build confidence in communicating effectively from the classroom to the courtroom. The second edition has been completely revised and updated to cover all aspects of language as used in a legal context where effective communication is crucial to both academic and professional success.